A promising new treatment in Austria for atrial fibrillation in horses is using targeted electric shocks administered via catheter directly to the heart. Irregularities of heart rhythm may impact performance, and conditions such as atrial fibrillation, with uncoordinated muscle contractions, result in reduced cardiovascular efficiency. 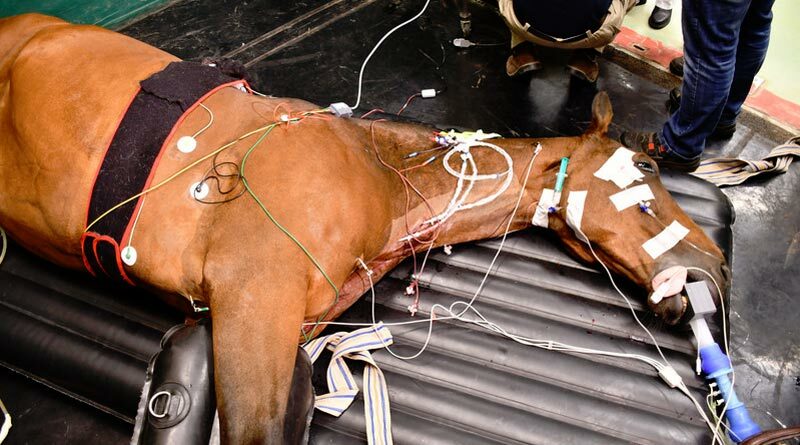 Transvenous electric cardioversion is a routinely applied therapeutic options in humans, and it is now available for horses at the University of Veterinary Medicine in Vienna. Traditionally, treatment for atrial fibrillation was based on medication with quinidine sulphate. Although often effective, it may be associated with a high risk of side effects. “In transvenous electrical cardioversion, surges are administered directly to the heart to reorient the confused atrial conduction,” said Jessica Cavalleri, head of the Equine Internal Medicine department. Special catheters, which can measure blood pressure, are used to introduce the electrodes to the heart. Pressure differences between the pulmonary artery, right atrium and right ventricle help confirm the electrodes are correctly placed. An ultrasound scan is also used to visualize the catheter in the heart. Before the horse is finally placed under general anaesthesia, the position of the electrodes is once again checked by means of an X-ray image. The many control measures are an important safeguard, adds veterinarian Dr Hannah Jung. The horse is then given a first shock under general anaesthesia. Further pulses are given, as necessary. With each shock the current is gradually increased. Values of up to 360 Joules may be required. The exact timing is important so that no dangerous cardiac arrhythmias are triggered. Once the heart rhythm reverts to normal, the horse is kept under anaesthesia for a short period of time and then allowed to wake up. The animal then remains in the clinic for three more days for monitoring. After a rest period of four weeks, a further inspection is carried out. Training can then usually resume. In contrast to drug treatment, Cavalleri reports that the success rate is slightly higher and the risk of side effects is lower.